Retirement income has increased by over 21% thanks to a rise in equity markets since annuity rates reach an all time low in August 2016 following the Brexit vote. Annuity rates reached an all time low in August 2016 as investors moved assets to safe havens such as gilts and bonds increasing the price and reducing yields. As annuity rates are based mainly on the 15-year gilt yields our benchmark example of a 65 year old with £100,000 shows annuity rates reducing to an all time low of £4,696 pa and are now at £5,183 pa. This remains far lower than the pre-financial crisis level of £7,908 pa reached in July 2008. Equity markets reached a recent low in February 2016 with the FTSE-100 index at 5,898 and has now recovered to an all time high of 7,470. The combination of strong equity markets and higher annuity rates combined to improve the prospects of people retiring higher by over 21% since August 2016. 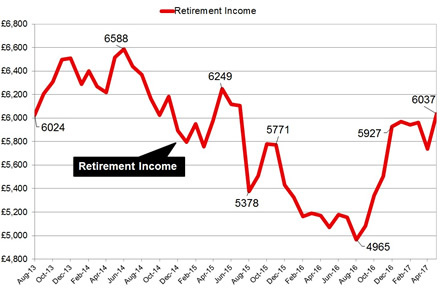 Income at retirement is up 21% since the referendum with higher annuity rates and equities. The income you can take from a pension fund depends on the value of the underlying investments and the annuity rates at the time. For those invested before buying an annuity a rise or fall in equities can make a significant difference to the income they can expect. Annuity rates reached an all time low due to the uncertainty created after the Brexit vote. This resulted in the 15-year gilt yields decreasing from 1.96% before the referendum to an all time low of 0.90% in August 2016. The above chart compares the retirement income from a fund of £100,000 starting in August 2013 and the income you could receive combining the growth in equities assuming your fund tracks the FTSE-100 index and annuity rates for our benchmark example at different points in time. It assumes the annuity income is for a 65 year old buying a single life, level basis income. In August 2013 the annuity rate was £6,024 pa for a fund of £100,000. If you waited until June 2014 the rise in equity value of the fund and annuity rates would mean you would receive a retirement income of £6,588 pa, a 9.3% rise. Since this date the trend has been down reaching a low in August 2016 where equity markets had reduced slightly but annuity rates were 23.5% lower and income was only £4,965 pa. The combination of improved annuity rates and equity values means for those pension funds that are invested there has been a 21.5% recovery in the income you can take from the fund since August 2016. However, the income is now back to the level you could have received back in August 2013. When you compare only the annuity rate, in August 2013 for a fund of £100,000 it was £6,024 pa and today it is £5,183 pa showing that despite annuities being considerably lower, equity markets have helped to provide higher retirement income. Annuity rates remain close to their all time low with only four months in the last ten years (or the last 120 months) are lower than rates are today. A return to the August 2013 level would see annuity rates rise a further 16.2%. 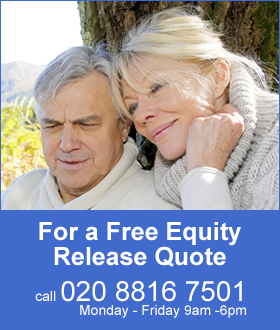 Many people yet to receive their State pension would consider delaying buying an annuity whiles rate are so low and instead opt for flexi-access drawdown or a fixed term annuity to allow rates to recover further. The improvement since the Brexit vote makes a material difference to the future income you can receive from your pension fund as the income receive in the above example has improved by £1,072 pa from £4,965 pa in August 2016 to £6,037 pa.
Over the lifetime of the annuitant based on the Office of National Statistics (ONS) we would expect a male to live for 17.3 years. This would mean he will have £18,545 more over his lifetime and for a female she can expected to live for 20.4 years increasing her income by £21,868.